Like his fellow Founding Fathers, George Washington was a man of many talents. Among the numerous skills of America’s first president was the ability to create his own unique blend of whiskey. And now, the curators of the Mount Vernon estate plan to release a limited run of the rye whiskey made according to George Washington’s specifications. 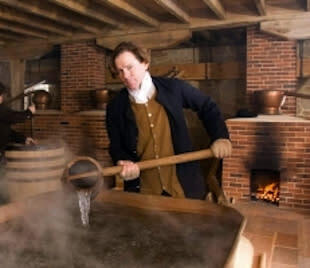 “People like having a tangible connection to the founding fathers, and any way they can connect that through food or drink, it’s an exciting element for them,” Mount Vernon spokesperson Melissa Wood told ABC News. The curators of Mount Vernon previously re-created Washington’s 250-year-old distillery, which was one of the largest in America in Washington's day. During its peak year of 1799, his distillery produced 11,000 bottles of rye whiskey. The distillery will produce about 10 percent of that annual volume, creating a batch of 1,100 bottles, which will sell for $95 each, beginning April 4. But should you trade in nearly 100 bills featuring George Washington’s visage for one bottle of his signature booze? Well, Washington’s whiskey was a blend of 60 percent rye, 35 percent corn, and 5 percent malted barley, resulting in what the website Death And Taxes described as tasting like “rotgut at best."